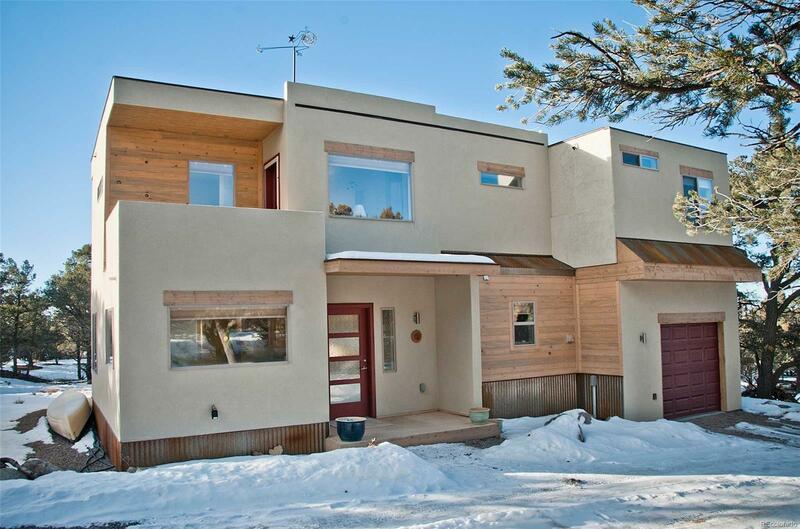 New 1450sf 2-level mountain contemporary home with attached 308sf garage on lovely & private 0.94-acre lot in Chalet 1. This home is on the corner of a quiet cul-de sac a convenient 5 min from town on paved road with great mountain/valley views. Exterior is a handsome mix of sand-colored stucco, light-colored pine & corrugated steel. Living, Dining & Kitchen are on the main floor, along with combined half-bath/laundry/utility room. Kitchen has stainless steel appliances, hickory cabinets, and granite tile counters. Bright Dining has sliding doors to south-facing patio. Living has large windows and wood stove. 2 short flights of stairs to the upper floor and two bright large bedrooms, each with full en-suite Bath (master has dbl-vanity) and two covered balconies, one with exterior stairs down. Efficient ETS heater on main floor with electric baseboards in Beds/Baths. Cordless top-down bottom-up honeycomb blinds throughout. House is 2x6 framed and sits over 5 1/2' crawl space. Act now!